Orange County neurosurgeon Robert Louis, MD specializes in minimally invasive endoscopic transsphenoidal surgery for removal of tumors in the pituitary gland, sellar region, and sphenoid sinus of the skull. With this sophisticated technique, Dr. Louis approaches the pituitary through the nose using a microscope and a light called endoscope. Pituitary tumors cause a variety of hormone problems and can grow to large size, compressing important nerves and arteries at the base of the brain. When this occurs, surgery is needed to remove the tumor, especially when vision is at risk. Tumor removal using endoscopic transsphenoidal surgery often reverses endocrine problems and restores normal hormone balance. 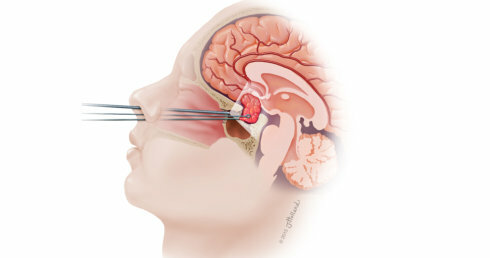 This minimally invasive technique uses a small incision at the back of the nasal cavity and causes little disruption of the nasal tissues. Robert Louis, MD works through the nostrils with a tiny camera and the endoscope. Bony opening is made in the nasal septum, sphenoid sinus, and sella to reach the pituitary. Once the pituitary is accesses and exposed, Orange County neurosurgeon removes the tumor. This procedure is often conducted with a team of neurosurgeon and ear, nose, and throat (ENT) surgeons. Some pituitary tumors grow beyond the reach of the transsphenoidal approach and may require more extensive operation that uses a craniotomy combined with skull base approaches. For prolactinoma, surgery may not be required as this type of tumor responds well to medication and close observation with periodic MRI to monitor tumor growth. You will visit Robert Louis MD – Orange County Neurosurgeon before endoscopic transsphenoidal surgery during which time details of the procedure will be explained, its risks and benefits, and answer any questions you may have regarding the procedure and your condition. After the visit, you will sign consent forms and complete paperwork to establish your complete medical history (allergies, prescribed or non-prescribed medications, anesthesia reactions, previous surgeries). Presurgical tests (e.g., blood test, electrocardiogram, chest X-ray, and CT scan) will be scheduled days before the surgery. Some of the medications you are taking may need to be continued or stopped on the day of your scheduled surgery. A week before your scheduled endoscopic transsphenoidal surgery, you will be asked to stop taking all non-steroidal anti-inflammatory medicines and blood thinners. You will also have to stop smoking and chewing tobacco one week before and two weeks after surgery as these can cause bleeding problems. You will have an office visit with a neurosurgeon, ENT surgeon, and endocrinologist before surgery. A consult with an ophthalmologist may be necessary if you have vision problems. During the office visit, the surgeon will explain the procedure, its risks and benefits, and answer any questions. Next, you will sign consent forms and complete paperwork to inform the surgeon about your medical history (i.e., allergies, medicines/vitamins, bleeding history, anesthesia reactions, previous surgeries). Discuss all medications (prescription, over-the-counter, and herbal supplements) you are taking with your health care provider. Some medications need to be continued or stopped the day of surgery. You may be scheduled for presurgical tests (e.g., blood test, electrocardiogram, chest X-ray, and CT scan) several days before surgery. A week before your scheduled endoscopic transsphenoidal surgery, stop taking all non-steroidal anti-inflammatory medicines and blood thinners. You will also have to stop smoking and chewing tobacco one week before and two weeks after surgery as these can cause bleeding problems. After the endoscopic transsphenoidal surgery, you will be taken to the post-operative recovery area. Your blood pressure, heart rate, and respiration will be monitored. If you have any pain, your neurosurgeon, Dr. Louis and medical staff will address it. You will be moved to a regular room when you wake up from the anesthetic effect. During your stay, you will be required to increase your activity level, such as sitting and walking. If needed, you may spend a night in the neuroscience intensive care unit for more observation and closer monitoring. After this surgery you may experience nasal congestion, headache and nausea. You will be prescribed medication that can relieve these symptoms. Dr. Louis may see you the day after surgery to check that your pituitary gland is producing right levels of hormones. If it is found insufficient, you may be prescribed hormone-replacement medications. An MRI of your brain will be taken the day after surgery. Within a day or two, you will be released from the hospital and given discharge instructions. You may feel some discomfort after surgery. Pain medication will be prescribed to manage your pain for a limited period of time to avoid addiction to narcotics. Pain medicines cause constipation so drink lots of water and eat high fiber foods or you can use over-the-counter laxatives. Ask your Orange COunty neurosurgeon before taking non-steroidal anti-inflammatory drugs because they may cause bleeding. Additional medicine may be prescribed to regulate hormonal levels. Some patients develop side effects from hormone medicines such as hunger, thirst, mood swings and body swelling. Blood samples may be taken to test drug levels and manage the side effects. Avoid bending over/straining on the toilet. Fatigue is common after endoscopic transsphenoidal surgery. It is recommended that you gradually return to your normal activities. Sitting and walking is encouraged. You may shower the day after surgery unless otherwise instructed by your neurosurgeon. To relieve nasal congestion and prevent bleeding, you will be given a nasal decongestant and a salt water nasal spray. If your neurosurgeon conducted an abdominal incision to obtain a fat graft, it should be left open and avoid direct water on the incision to prevent any infection. Vitamin E liquid can be applied to the incision daily. You will be scheduled for follow-up visits with your Orange County neurosurgeon, Dr. Louis, from the first week after surgery to remove the nasal splints and to check the surgical site. Appointments with your neurosurgeon will be scheduled for 2-4 visits. An endocrine follow-up may be recommended to determine if hormone replacement medications are needed. Sometimes small crusts often form in the nose that can cause nasal congestion. The crusts can be easily removed with local anesthesia sprayed to the nasal cavities. Four weeks after surgery, the patient will be instructed to use a saline nasal rinse to decrease the need to remove crusts and promote nasal healing. If the tumor causes hormone secretion such as Cushing’s disease or acromegaly, your hormone levels will be closely monitored after surgery to determine whether they have normalized. Patients with Cushing’s disease usually have small tumor or microadenoma, which is surgically removed and cured most of the time. Patients with acromegaly often have larger and more invasive tumors, with success ratios of about 60 percent. There are some pituitary tumors that remain surgically incurable due to invasion of the cavernous sinuses and other important structures. Radiosurgery may be recommended to treat unresectable tumor remnants with good long-term control rates. Medicines are prescribed to control excess hormone secretion due to residual tumor after surgery for acromegaly and Cushing’s disease. Vision loss- Optic chiasm can be damaged during surgery or the nerve may have been permanently damaged by the tumor. Pituitary gland damage- common occurence for macroadenomas. Hormone replacement may be required after surgery, such as cortisol, thyroid hormone, growth hormone, estrogen, or testosterone. Diabetes insipidus- due to damaged posterior lobe of the pituitary gland, leading to frequent urination and excessive thirst, because the kidneys inadequately concentrate the urine. This is usually temporary and lasts from 1-3 days. Medication called desmopressin acetate (DDAVP) in nasal spray or pill form may be prescribed to help control frequent urination. Cerebrospinal fluid (CSF) leak- the fluid surrounding the brain can leak through a hole in the dura lining the skull. In about one percent of transsphenoidal cases, a clear watery discharge from the nose, postnasal drip, or excessive swallowing occurs, requiring another surgery to patch the leak. Meningitis- an infection of the meninges that is usually caused by CSF leak. Sinus congestion- small adhesions can stick together and form scars that block air flow through the nose. Nasal bleeding- this occurs in less than one percent of patients and may require surgery to correct. Stroke- the carotid arteries and cavernous sinuses located on both sides of the pituitary may get damaged during surgery and cause an interruption of blood supply to the brain. Orange County neurosurgeon Robert Louis, MD specializes in minimally invasive endoscopic transsphenoidal surgery for the removal of pituitary tumors. For appointments, please call (949) 383-4185 or Contact Us.